Leeds agency Hatch Communications has been appointed by Koupe, the protein ice cream, to launch the brand to the UK market. The brand, which was founded in Holland in 2015, is available through online retailer Ocado as well as 400 supermarkets across Europe. Hatch will use its FMCG experience to launch Koupe to the UK market and increase its presence across retail outlets. 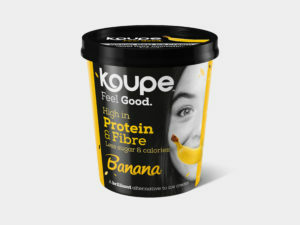 High in protein and fibre and available in four flavours - Clever Chocolate, Brilliant Banana, Victorious Vanilla and Smart Strawberry - Koupe contains only a quarter of the sugars of traditional ice cream and doesn’t use any artificial flavourings or colourings. Hatch director Matt Peden said his team "lends itself perfectly" to delivering the launch.